Today is Lori's (1/2 of the designing duo Scraps 'N Pieces) birthday. 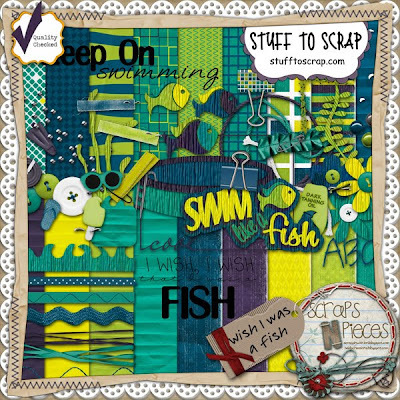 In honor of her special day, she has a free kit for you called Wish I Was a Fish. It was originally a mini they created last summer for the Color Challenge, but have expanded it to a full-size kit. It will be free TODAY ONLY. After that, it will be available for $3.99. Product image is linked to the store. Also, you can pick up a kit of your choice with coupon SNPbirthday on Monday for 43% off since that just might be how old she's turning. This does not include their High School Memories kit, but anything else is fair game.